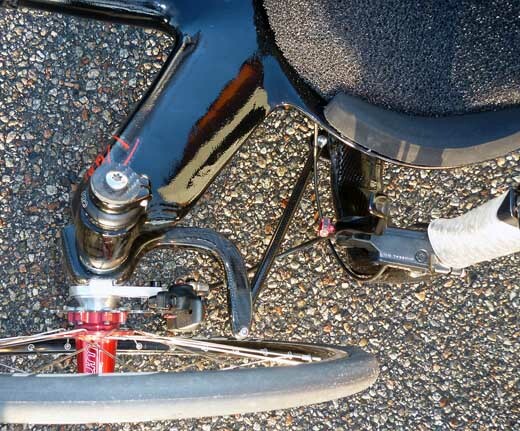 One of our friendly customers has made a substantial and serious comparison test of CARBONTRIKES Race SL vs. Catrike 700 (which by many has been considered to be the fastest trike on the market). The test results clearly show that CARBONTRIKES Race SL is the winner in the test. We wish to emphasize that the customer is an elderly gentleman, but is a very experienced trike riders with several records. In the test, there is also a traditional racing bike, which is fast, but these test values are made when the test rider was younger and therefore faster. So that comparison is somewhat misleading we believe. CARBONTRIKES has also done lots of testing and power measurements, we are going to publish them, but for now you can study the test report. We would like to thank Gerd M. Rosenblatt, USA for his fine work with the test. One of the charts from the test report. 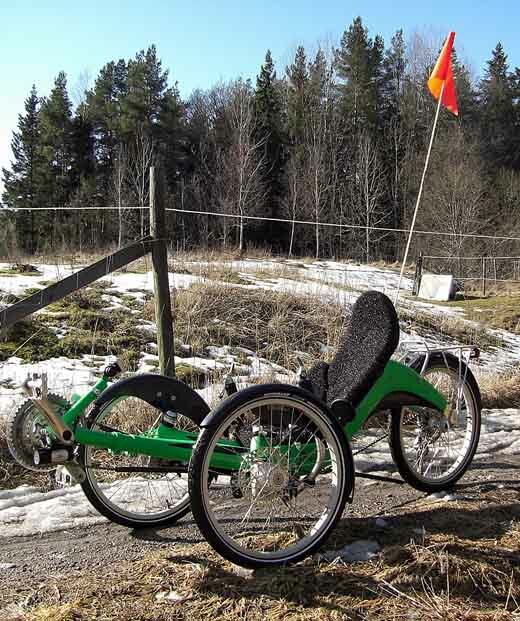 During the development of CARBONTRIKES various prototypes have been hardware tested in different environments under widely different conditions. We have done this in order to create the most reliable and high-quality product - without compromising driving pleasure. Now the winter has come to Sweden. 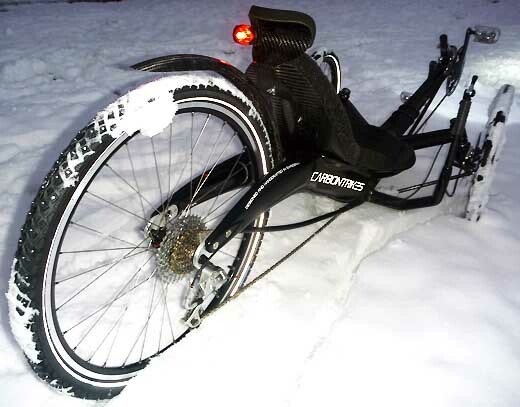 With sturdy spikes tires from Schwalbe, snow and ice are no problem. 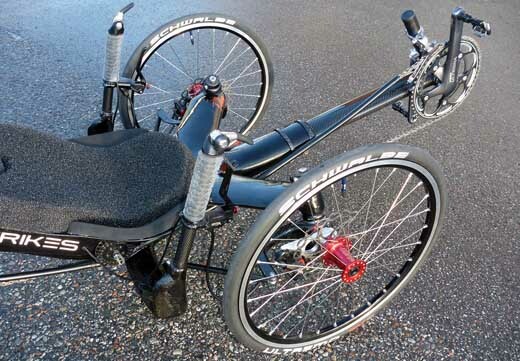 This particular CARBONTRIKES was our fair trike on the Sweden Bike Expo 2012. 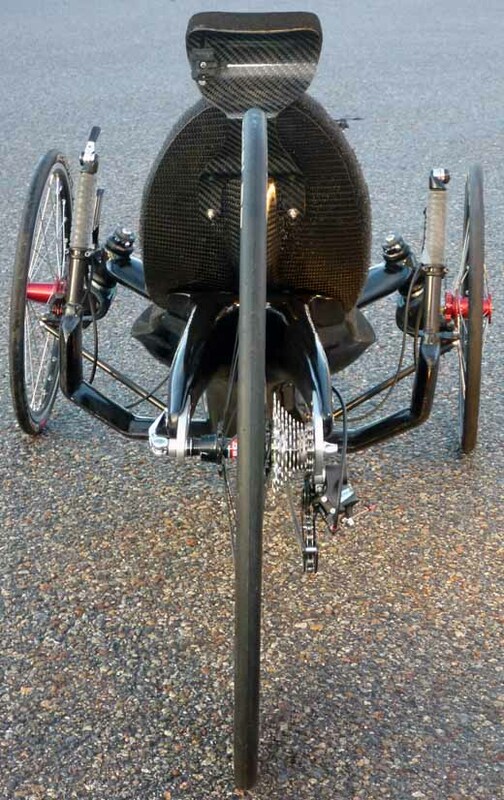 The trike was equipped with our lightweight 20” front wheels and the 28” carbon fiber high-profile aero rear wheel. 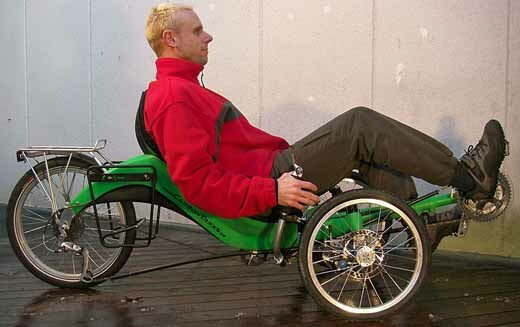 Also the trike has the carbon fiber neck rest and the new monocoque aerodynamic handle bar. The frame was painted black, with the rest of the parts in clear coat carbon fiber, to make an interesting and beautiful contrast. 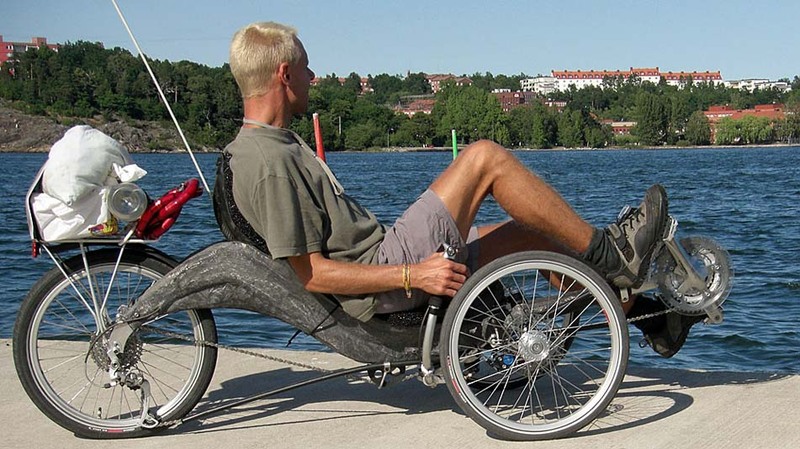 The weight was only 11,0 kilos/24,2 LBS - without losing the stiffness of the trike. 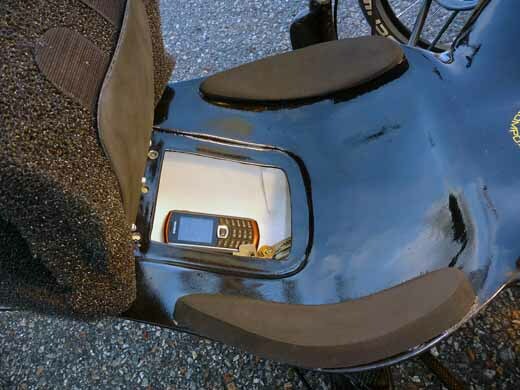 The two piece Comfort seat pad is relaxing, ventilated and reduce road vibrations. Handlebar airfoil has the same angle as the outriggers and link rods taken to create aesthetic harmony and flawless function of the steering. 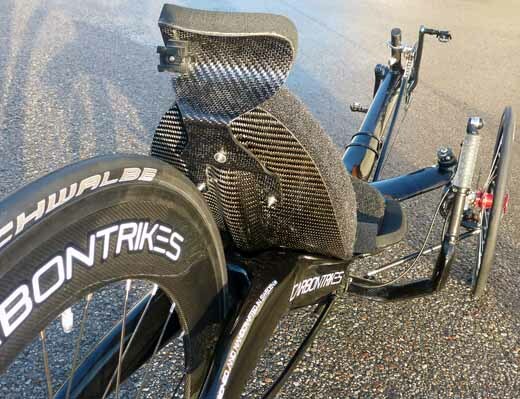 To protect the trike uses CARBONTRIKES special heat treated paint suitable for carbon fibers. 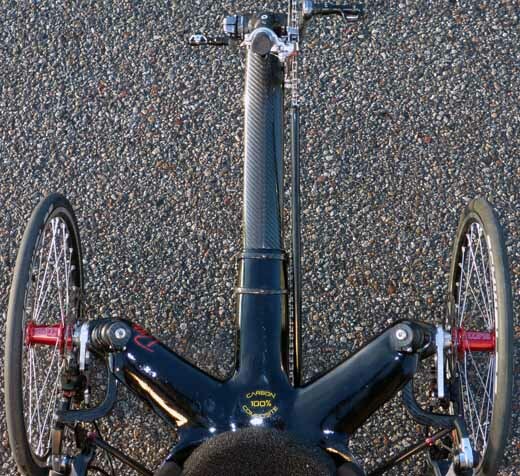 The wing-shaped (NACA 0024) outriggers are angled to facilitate when rider step up and down. The structure also provides suppression and reduction of road vibrations. The aerodynamically (NACA 0021) designed carbon monocoque handlebar is light, strong and stiff. 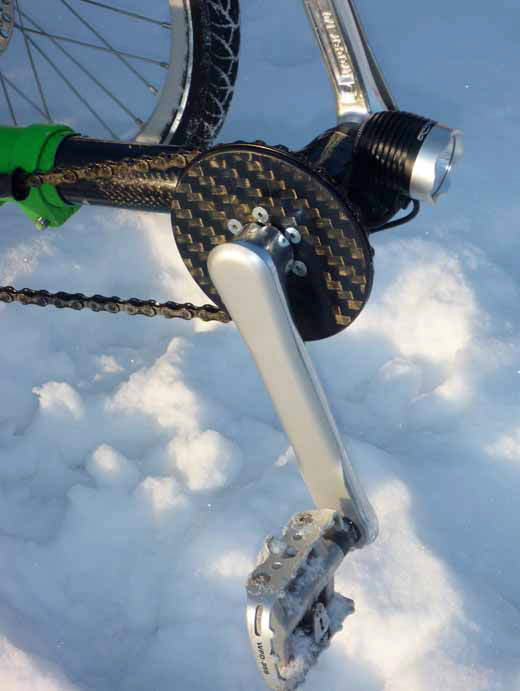 The chain is integrated in the frame to provide a perfect and effective chain line. The unique wheel mounting is made of carbon fiber. The design combines strength, low weight and tight turning radius. It also provides a steering with millimeter precision. 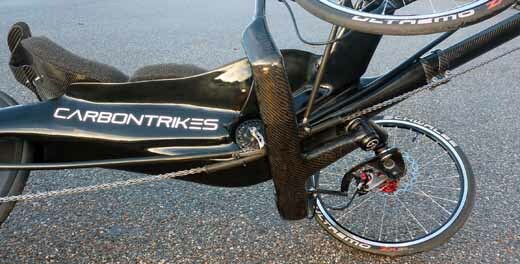 CARBONTRIKES uses hydraulic brakes as standard, for maximum stopping power and control. 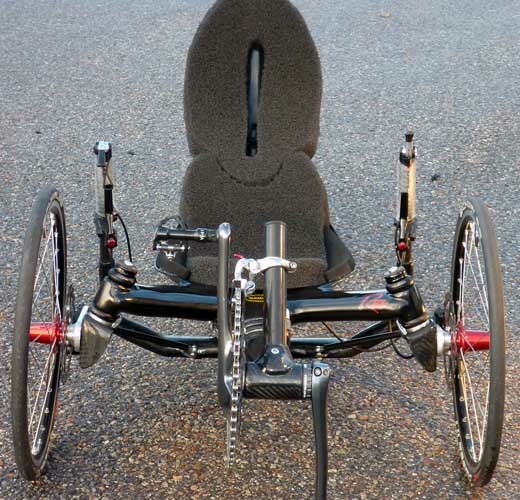 Both the seat and headrest are adjustable to give the rider perfect ergonomics and support. 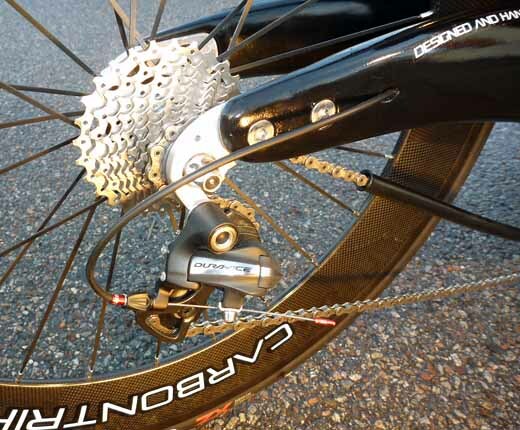 CARBONTRIKES use Shimano XTR- or DuraAce rear derailleur as standard. The smart integrated storage compartment holds over six liters. 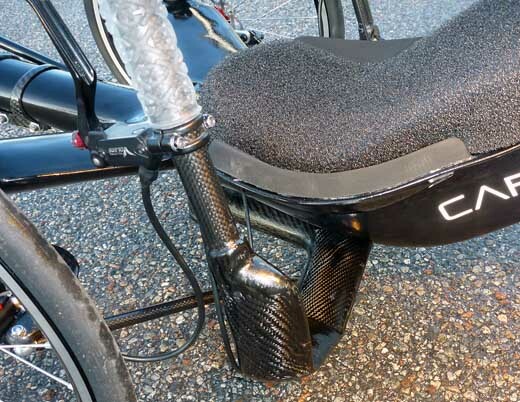 During active riding the seat side cushions gives high friction, to give maximum grip when the center of gravity changes. 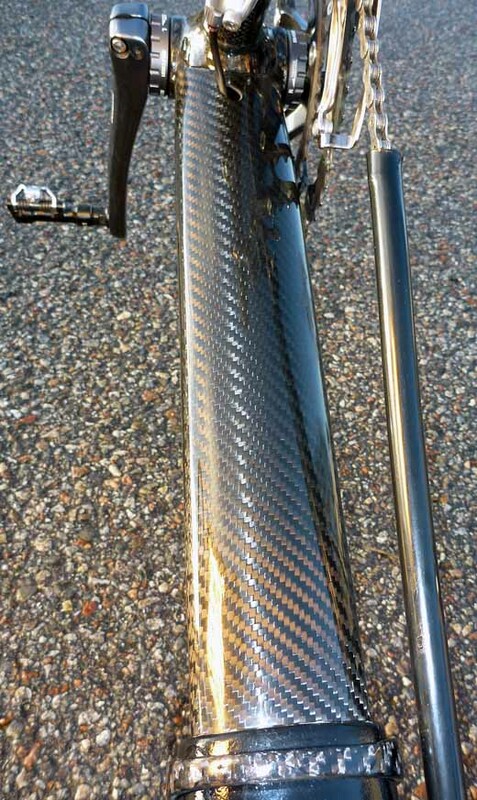 CARBONTRIKES prototype with carbon fiber fenders. CARBONTRIKES prototype with 20 "rear wheels and 16" front wheel equipped with rack ready for fast touring. Modified Schlumpf gear systems, and LED lighting - equivalent to 50 watts halogen, during the evaluation. CARBONTRIKES pre prototype during a testride. 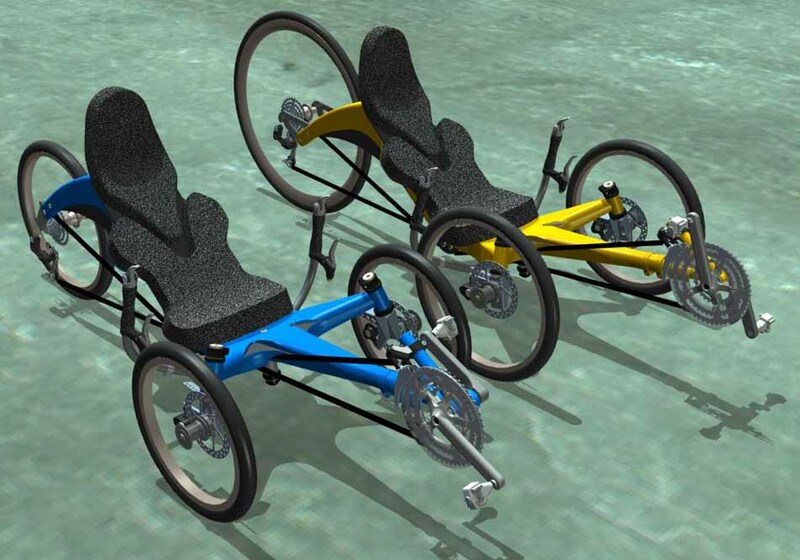 Studie of CARBONTRIKES CAD prototypes. Blue model 16" FW and 20" BW. Yellow model 20" FW och 28" RW.